Russian threats against American media outlets based in Moscow reached a new level on Monday, when officials sent letters to news organizations backed by the US government, warning them of possible "restrictions." The letters and increasingly intimidating rhetoric from Russian officials are retaliation for what they allege is the U.S. Justice Department's crackdown of state-funded news organizations like RT and Sputnik in the US. It's the latest in an escalating war of words the Russian government is waging as it comes closer to taking measures against U.S. media in Russia. 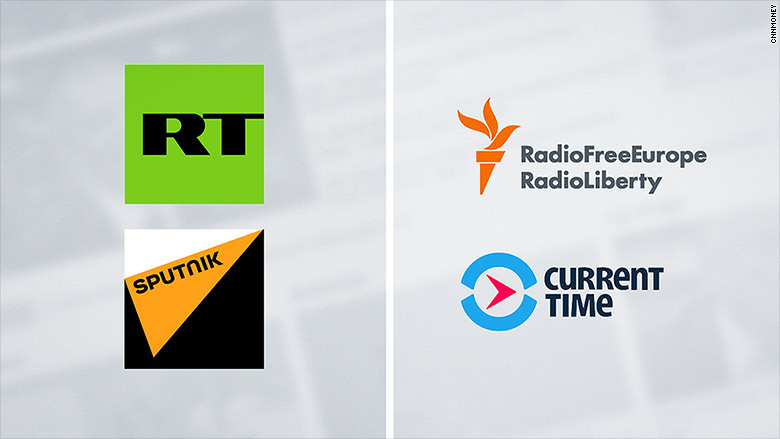 The Russian Justice Ministry on Monday sent warning letters to both Radio Free Europe's Russian service, called Radio Svoboda and to Current Time, a Russian-language cable news network launched by Radio Free Europe and Voice of America as an alternative to state-funded news. A Russian-language website run by Radio Free Europe's Tatar-Bashkir service, called Idel Realii, also received a similar letter, which said the outlets fall under a Russian law as a foreign agent and NGO, and therefore authorities have the right to impose "restrictions" on the organizations. It's not clear if other news organizations received similar letters. "The activity of your organization may be subjected to restrictions envisioned in the legislation of the Russian Federation," the statement from ministry official Vladimir Titov said, according to Radio Free Europe. "Current Time, Radio Svoboda, and Idel Realii are journalistic organizations. We trust we will be able to continue our work," Radio Free Europe Vice President and Editor-in-Chief Nenad Pejic said in a statement. Over the past several weeks, Russian officials have repeatedly lashed out with public threats against American media in Russia in retaliation for what they say are inappropriate pressures placed on their outlets, like the television network RT and news website Sputnik. Sources at Radio Free Europe say that nothing concrete has come out of Russia's threats, but the tension is palpable. The network already faces severe restrictions in distributing its content within Russia. An official from the Broadcasting Board of Governors, the U.S. agency that oversees Radio Free Europe, said the U.S. Ambassador to Russia, Jon Huntsman Jr., was briefed on the ongoing spat between the two countries. Radio Free Europe has a bureau in Moscow which employs more than 50 people, including Russian nationals. "The networks of the BBG, including Voice of America, Radio Free Europe and Radio Liberty, are free and independent of the United State's government and deploy honest and independent journalism on behalf of our audiences around the world," BBG CEO John Lansing said in a statement. "Any attempt to stifle them by authoritarian regimes is a direct assault on the rights of all people around the globe to have access to the free flow of truthful information,"
On Monday, the Russian embassy in the United Kingdom released an unusual tweet, quoting the Russian Foreign ministry saying it was "ready to impose restrictions on US-owned media in Russia, no matter, state or private, in response to what is done vs @RT_com." The tweet included an illustration of a face with hands covering its eyes and mouth, and what looks like a distorted CNN logo made to look like "CIA" on its forehead, with the tag line "distorting reality worldwide." The embassy tagged the BBC's Russian operation and BBC reporter Daniel Sandford, who previously covered Russia but now focuses on the U.K. A review of the Russian Embassy's tweets shows that it often tags Sandford and other journalists in similarly unrelated tweets. Representatives from the U.S. State Department did not immediately return a request for comment. RT claims that the Department of Justice last month sent a letter to the Russian company that services its American affiliate, asking them to register as a foreign agent under the Foreign Agents Registration Act. RT has a global web presence funded by the Kremlin and airs around the world in six languages. The FARA is meant to thwart undisclosed foreign propaganda from swaying the American public, but it is not traditionally applied to media companies. The Department of Justice has repeatedly declined to comment about RT's claim that such a letter was sent. RT America was singled out in a January intelligence community report for the impact it may have had on the 2016 election. The report said RT "conducts strategic messaging for [the] Russian government" and "seeks to influence politics, fuel discontent in the U.S." The report also cited the Russian-funded news website Sputnik as "another government-funded outlet producing pro-Kremlin radio and online content." RT head Margarita Simonyan said last week that staff in the United States "fear for their security" because of the negative publicity. It's become hard to hire for the network while other staff members are leaving en-masse, said Simonyan, who was cited by Russian state-run news wire TASS. Last week, Russian Foreign Ministry spokesperson Maria Zakharova doubled dpown on the threat, saying that "everything that Russian journalists and the RT station are subject to on U.S. soil, after we qualified it as restriction of their activities, we can apply similar measures to American journalists, American media here, on Russian territory." Kremlin spokesman Dmitry Peskov last week cited the "continued violation of the rights of our media to work unimpeded" as a reason why they "cannot rule out that actions will be taken in accordance with the principle of reciprocity."